Shearwater Research has earned a solid reputation and a loyal following among technical divers, especially within the rebreather community. To those familiar with their products, it will come as no surprise to learn that the company's latest offering delivers a full range of advanced features and capabilities. What may be a bit of an eye opener is the look and feel of this new model, which may help Shearwater capture the attention of a broader segment of the diving population. I've been a big fan of Shearwater computers since I bought my first Pursuit in 2007 with the Pursuit, and I now dive with their Petrel 2 EXT. In addition to their reliability, I have found them will-suited for a wide range of applications ranging from open-circuit Nitrox to mixed gas and CCR diving. In addition to versatility, another outstanding feature of Shearwater products has always been ease of use. All functions and menus are controlled by an intuitive, easily-navigated two-button interface which makes these computers immensely simple to program - even underwater. When the first images and press release on the new Perdix came across my desk, the thing that caught my attention was the physical appearance of the unit. While that may seem superfluous to some, the reality is that in today's market, style does matter. Given the number of feature rich, fancy looking new model computers rolling out from, Liquidvision, Mares, Poseidon, Scubapro and Suunto to name a few, competition is getting fiercer. 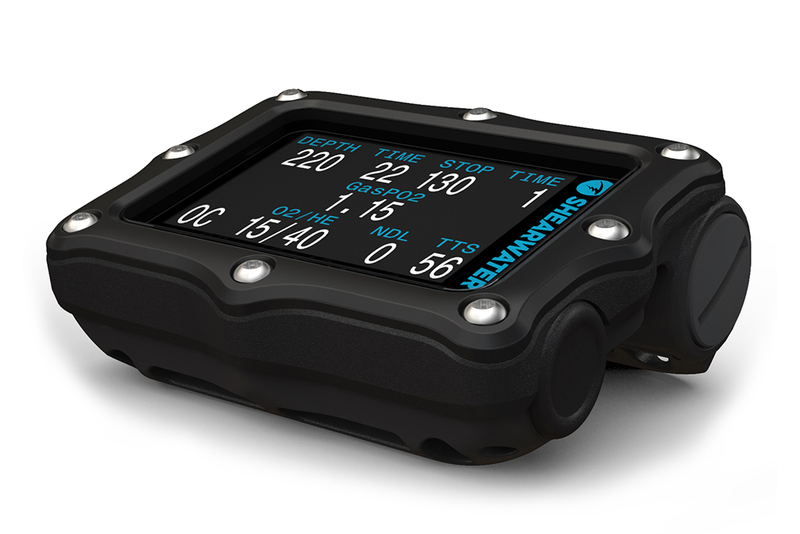 Instead of the somewhat blocky look that has long been synonymous with Shearwater wrist mount dive computers, the Perdix is more rounded and streamlined. The most noticeable change in aesthetics is the Perdix’s actual face. Missing is the single 2/8-inch/5mm thick Lexan faceplate, which has been around since the beginning with the Pursuit all the way to the current Petrel’s. In its place, Perdix’s Lexan faceplate, covering a new large 2.2-inch/55.8mm wide, high-resolution color LCD display, is held in place with bezel made of the same material used in the case anchored down with 8 stainless screws. While it roughly maintains the same 83mm (2.9”) width by 74mm (3.26”) length dimensions as a Petrel, the Perdix is roughly 30% smaller in volume, 30% lighter in weight at 154g (0.34 lbs) vs. 260g (0.57lbs) for the Petrel SA. To achieve this weight reduction, Shearwater shifted from their traditional approach of milling the computer housings from a block of Delrin with a CNC machine, to an injection molding process that uses a special nylon resin reinforced with glass fiber. In addition to being lighter, the glass filled nylon resin carries a higher tensile strength and greater rigidity than most other resin based materials. A second advantage with injection molding process, molds can be tooled to accommodate surfaces with greater curvature where needed for greater ergonomics. In the Perdix’s case, the underside of the computer’s housing is deeply concaved, allowing it wrap around the wrist instead of riding atop it, like all Shearwater models have in the past. Shearwater also added four holes next to the slots for the wrist straps so that a diver has the option of using bungee cords in place the supplied straps. The end result is the Perdix has a 30% lower-profile on the wearer’s wrist, making for an overall sleeker and more streamlined appearance. On a more practical side, speaking with Tony Land at Add Helium who got to see one of the first units before release, Tony really like the fact that it did not hang any where near as easy as Petrel SA when climbing into his BCD. Looks aside, the Perdix follows the same form factor as its siblings, with modes that cover Open-Circuit Recreational, Open-Circuit Technical and Closed-Circuit fixed PPO modes, as well as a Gauge Mode. All are operated through the two-button menu system. In Open-Circuit mode, the Perdix is a multi gas (air, Nitrox, Trimix) decompression computer that allows the user to program in up to 5 bottom mixes along with 5 deco gasses. For simpler air/Nitrox applications, the Perdix can be set to one, two or three different gas percentages. In addition to the ability to perform gas switches quickly and easily with a minimal number of button pushes, users can also add or edited gas mixes while underwater. This ability provides a significant added safety factor for situations where gas mixtures must be substituted or changed due to unforeseen circumstances during the dive. All Shearwater dive computers use Buhlmann ZHL-16C as the primary decompression algorithm, with the option of adding the VPM-B algorithm if desired. In additions, manipulations of gradient factors settings to make the computer more liberal or conservatism are also user adjustable within the computer’s settings. Among the additional features incorporated into the perdix is a three-axis, tilt-compensating, digital compass. When placed in compass mode, the perdix’s large high resolution, 2.2” LCD display provides the diver with a digital heading while at the same time continuing to display depth, time, deco info and gas PO2 information. In closed-circuit mode, the Perdix stores banks of 5 closed-circuit diluent gasses along with 5 addition gas choices for open-circuit bailout. The one thing I found slightly disappointing was that the Perdix will not be offer in a EXT version for external PO2 monitoring on a CCR simply because there's no room in the new size computer housing for a fischer connector or any hardwired cable system to fit. As it stands the Perdix will only be a Stand Alone (SA) computer for CCR purposes. One might conclude Shearwater’s reasoning stems from the fact that OC technical divers still greatly outnumber CCR divers. Plus, most of those who are diving the latest generation CCR’s have PO2 monitoring already built into the unit by the manufacturer. The most likely reason, not enough room in the new housing to except a port for a Fischer cable. Incidentally, Shearwater Research is the primary supplier of handset/controllers used on the Hollis’s Prism II, Dive Rite Optima, and JJ Rebreathers. Therefore the majority of CCR divers that will be looking at the Perdix will be doing so with the intention of having it as a back-up standalone dive computer running a fixed set-point. As for those CCR divers with units like my KISS Classic Rebreather or an early model Meg, rEvo or even a home built with Fischer cables, it’s not the end of the world; there is still the Petrel EXT and N.E.R.D. The Perdix runs on a single user-replaceable AA (your choice: alkaline, Li-Ion, Photo Lithium 1.5 or NiMH) battery, which can be changed in the field with minimal effort. Another neat trait of the Perdix is that Shearwater changed where the tissue data is stored so that it is not lost during a battery change. Even though the Perdix LCD screen is slightly larger (by .2 inches wider) than other models, Shearwater states that the Perdix is more efficient, which will allow the battery to last 30% longer. I can't verify that claim yet, but time will tell. Addition noteworthy features include the ability to set information in metric or imperial units, a 1000-hour dive log, free firmware releases with Bluetooth integration, and download and upload capability via Bluetooth with Mac, PC, and iOS devices. The Perdix comes ready to use out of the box with no pin upgrades required for use for open-circuit, closed-circuit or gauge modes. With a retail price for the Perdix will be around $779.00 USD (based on the exchange rate for $1075 CAD), the same price as the Petrel 2 Stand Alone model. Shearwater Research will continue to manufacture the Petrel EXT model to for obvious reasons, but currently have no plans to discontinue the Petrel SA, which is a little puzzling when the Perdix appears to offer all the same as the Petrel SA but in a little more smaller, more low profile design. To me, given the choice between the Petrel SA and the new Perdix, I would put my money on the the Perdix. The Perdix is now available for purchase through the Shearwater dealer network. Full technical specifications for the Perdix can be found on Shearwater’s website, as well as a tutorial video highlighting the features of the Perdix on Shearwater's YouTube page. 0 Comment(s) to the "First Look: Shearwater Perdix"